A little less than a year ago, we did a shootout between various dual bay notebook enclosures. Since then some new products have appeared including a Thunderbolt dual bay notebook enclosure from LaCie. We decided to do another shootout to see how much the new crop exceeds the 200MB/s barrier we encountered. 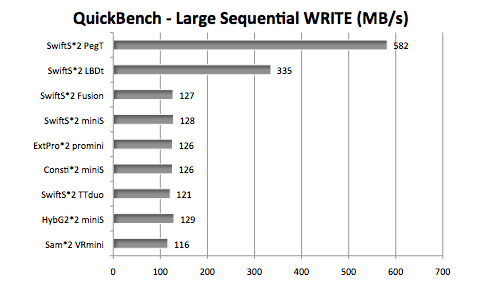 Thunderbolt is the fastest option for Apple laptops. Seekers of fast external storage on the MacBook Pro have been frustrated in the past with only FireWire and USB 2.0 ports. Even those models with ExpressCard slots have limited bandwidth as you can see from the write speeds in the graphs. Thanks to Thunderbolt, the external enclosure transfer speeds of dual bay RAID 0 setups have more than doubled. Dual port eSATA notebook enclosures are fast, but bandwidth limited with ExpressCard. The fastest dual bay eSATA enclosures had two eSATA ports -- one for each drive. That produced read speeds significantly faster than the dual bay enclosures with a single eSATA port. However, the write speeds were about the same for both. Because eSATA ExpressCards are bandwidth challenged and are only available on 17" MacBook Pros, the ExpressCard slot might be headed for extinction. However, the dual bay, dual port eSATA enclosures will continue to be a viable option for the Mac Pros with SATA/SAS host adapters. The Hybrid Solid State HDDs are not a panacea. 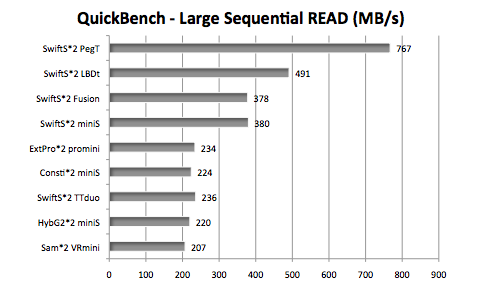 The 6Gb/s SSDs are faster than all interface options. Though we used 6Gb/s SSDs in our testing (to squeeze every last drop of speed), the 3Gb/s SSDs will produce similar results in most dual bay enclosures connected to the Apple laptops. And in the case of enclosures with single eSATA ports, the HDDs came very close to the SSDs in large sequential transfer speed. The biggest advantage in choosing SSDs for your Apple laptop's external storage is exhibited when doing small random transfers. They also trounce the HDDs in seek time and number of transactions per second. 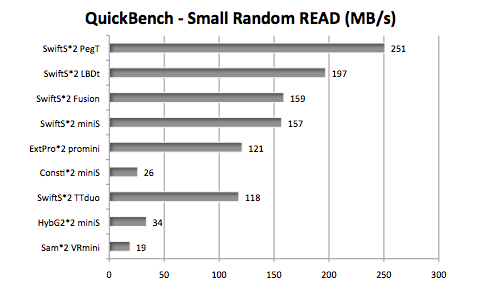 Synchronous SSDs are 80% faster than asynchronous SSDs in the real world. You may have noticed that there are different models of SSD. One difference is that the lower priced "consumer" models use asynchronous flash NAND while the higher priced "enterprise" or "pro" models use synchronous flash NAND. 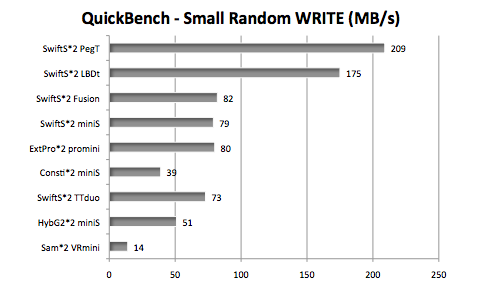 At first we saw little difference in performance as illustrated by the QuickBench graph below. But when we ran our Finder Duplicate test, it was clear that the SSDs with synchronous NAND were faster -- up to 80% faster. (For more on "synchronous vs asynchronous flash NAND," see the article on HardOCP. NOTE: In these graphs, we used a Mac Pro with the HighPoint RocketRAID 2744 to measure the maximum performance of the async and sync SSDs. The FirmTek miniSwap enclosure with dual eSATA ports housed the drives. Two easy access bays that require no trays or screws. The FireWire 800 port for a power source or as an alternative data connection. It also has a USB 2.0 port. When the eSATA port is active, FireWire port can be used in place of AC adapter for power source. 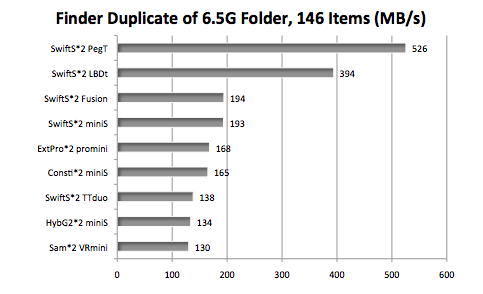 There are companies other than LaCie And Promise that will introduce Thunderbolt storage in 2012. Also watch for some interesting products like USB3/eSATA6G enclosures and combination Thunderbolt, USB3 and/or eSATA6G enclosures. When they ship, we will test and report. Feedback or comments? Contact me , mad scientist. Click on our Apple Store USA text links or display ads when you order Apple products. It's a great way to support Bare Feats since we earn a commission on each click-through that results in a sale.